Perfect for your next walk or awareness fundraiser. Remember every step when you look at this beautiful 3-D shoe charm. 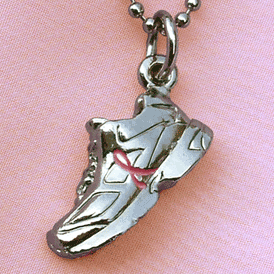 Pink ribbons adorn the shoe on the sole, sides, and heel of the charm. Need it in a different awareness color? Give us a call, we'd be glad to provide you with a quote. If the item you want is not shown here, BizPins can make a custom item for you in two to three weeks. Please call for details.